I think that for some time now, Memorial Day has had an identity crisis. For a lot of us, Memorial Day weekend marks the beginning of summer. And so we celebrate the holiday on the lake or at the swimming pool or just cooking out in the back yard. A lot of families schedule their annual reunions for Memorial Day weekend. Some treat it as another Veteran’s Day. But in the years following the Civil War, Memorial Day began as Decoration Day. (Show first picture) The place to celebrate Memorial Day was not at the lake, or at family reunions, or in the back yard cooking burgers and hot dogs. The place to be on Memorial Day was in the cemetery. It is supposed to be a day about remembering, but you see, the problem with Memorial Day is that it calls us to remember things that most of us really have no memory of because as a culture we suffer from what I call reverse dementia. Now let me explain what I mean. As my mother approached the end of her life, she began to suffer from dementia. I know many of you are dealing with this right now with family and friends. And in the last days she retreated into the past. She had very little short term memory, which impeded her ability to function on a day to day basis, to be present in the moment. And she spent her days with my father and grandparents and great grandparents, all of whom had passed on long before. When I would go and visit her she would usually know who I was, but I often found myself in her memories. Sometimes she would confuse me with my uncle who had died some fifty years before. And I would tell people that her dementia had stolen her memory from her, but I now realize that actually her dementia had caused her to rediscover memories that had been long buried. And though she often mixed those memories together, she was content dwelling in them. In the end, her dementia helped her see beyond the present and even the future, into her past. And what she was aware of in the present, served more as signposts for her journey into her past. In the last days, her life was defined by her memories. And in a sense, that is what Memorial Day is all about. It is a day to remember that who we are as a people today is really profoundly shaped by our past, by those who came before us and who gave their lives, so that we might be who we are today. But the problem is that our society suffers from kind of a reverse dementia. We have lost our long term memory, and are relying on our short term memory to define who we are – to shape our future. And the result is that we have forgotten who we are. Fred Craddock, one of the great preachers of the last century, tells this about a professor of literature he knew at the University of California, who was a member of the Kiowa Indian Tribe, though growing up that didn’t mean much to him. But the professor recalled a day when that changed. His father took him to a Kiowa tribal village and left him all day with an old woman who was the tribal storyteller. It was her job to keep the memories of the tribe alive. In a sense every day was Memorial Day in her presence. And so all day long the old woman told the young man the stories of the Kiowa people. The professor later wrote this about that day. “She sang the old songs, described the rituals and told the oral history of our people. She told how they began out of a hollow log in the Yellowstone River; of the tribes migration southward; of the wars with the other tribes; of the coming of the white man; of the buffalo hunts – the slaughter; of the coming of war; of moving southward again to Kansas; of starvation and disease; and finally, of the arrival at Ft. Sill and the reservation and confinement. And as she told the stories she would begin with the words “Remember when” even though all that she was remembering happened long before either of us was even born. By telling the stories, she was drawing me, as a young man, into the collective memory of the Kiowa people. When it was about dark, my Dad came and picked me up, and I left the old woman’s house, aware for the first time what it meant that I was a Kiowa Indian.” He had become a part of the story of the Kiowa people that day. And as Fred Craddock concluded the telling of the professors story, he said something most profound. He said: “Anyone who cannot remember further back than his or her own birth is an orphan.” Because you see in the act of remembering that young man discovered who he truly was. The stories that the old woman told him, both good and bad, had been the signposts that defined who the Kiowa people were and now are. And who they will be in the future. Just as the stories of those whom we honor on Memorial Day define who we are as individuals and as a nation. I believe the reason that our nation is in the state it’s in today, is because so many of us have lost our long term memory. We can’t remember (and really have no desire to remember) further back than our own birth. As far as many of us are concerned the only memories that matter are those that relate to our personal life span thus far. So why should we spend time in the cemetery today. We have no memory of those we honor. We don’t know their stories. We want to live for today. And let the past and the future fend for themselves. And all the while our nation is crumbling around us. And may I be so bold to say, that the same is true of the church. Many of us suffer from a kind of reverse dementia when remembering who God has been. And so we struggle with the meaning of scripture because we think that what was important in the past has little relevance for today. For our lives. And we downplay many of the rituals that decorated our faith in the times that are beyond our short term memories. And the result is that many of us, and many of our churches have lost their sense of who we are as the people of God. But the truth is that God realized early on that His children were going to suffer with memory issues that would manifest themselves in a loss of identity. And so that we would not forget, God provided us with story tellers, who would tell the stories of God and His providential love. That’s essentially what the Bible is, it is the words of the great story tellers written down and handed down through all of the generations of humanity, from the first moments of creation, through the stories of Jesus. And all of them have been told with the same hope and intention, and that in our hearing each one of us would become a part of the story. In truth the Bible is the greatest love story ever written. And every time we have forgotten God’s love, He has called us back into relationship with Him. Joshua’s stones call us to remember. They are memory stones. And so many times the stories of God end with memory stones. Jacob’s well was made of stone. The altar upon which Abraham was called on to sacrifice Isaac was made of stone. The Ten Commandments were written on tablets of stone. The story of the woman who was caught in adultery and brought to Jesus for justice probably ended with the story teller saying, “Remember how each of the accusers dropped the stones that were to be the weapons of justice to the ground and walked away. And the woman walked through the stones – forgiven and saved?” Remember when Jesus was entering Jerusalem on His way to the Cross the priests pleaded with Him to get the crowd to be silent, and Jesus said you can’t silence the praise of God. If the people stop, then these rocks will pick up the joyous chorus. And remember how they rolled the giant rock over the entrance to the tomb, thinking that would bury Jesus forever, but instead that rock rolled away and calls every generation to remember that God is not dead, calls us to new life. Memory stones. Time and again, the stories of God call us to remember God’s grace and love and providence. Memorial Day, if it is to have any meaning at all today, can’t just be about those who died in the past, but must also be about those who will carry their legacy into a better future. And so it is with faith. And so we decorate the memory stones in the cemeteries with flowers and flags, (show second picture) not just to celebrate a day but as an invitation to tell the stories that will recall the past, but also inform the present, and carry us forward into the future. We remember in 3D. And, of course, our memories aren’t just reserved for this one day of the year. Our memories are marked on other important days throughout the year. Any day of the year, you can drive through the Lexington cemetery and see freshly decorated graves. Signs of people remembering their loved ones. But have you ever visited a Jewish cemetery. (Show third picture). 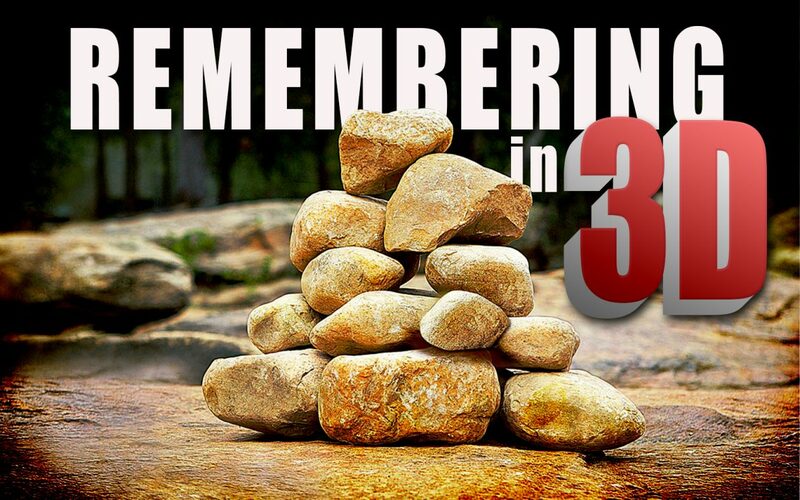 Remembering Joshua’s stones, a tradition arose of using stones to mark the important days of a persons life. And so people do not memorialize loved ones on their important days with flowers and bright decorations. Instead they place stones on top of the tombstones to help them remember, recalling the stones that marked the end of the long journey through the wilderness, but also the beginning of the conquest of the promised land. “And those stones are still there today.” The storyteller says. Memory stones. Remembering in 3D. The stones are placed on the tombstones so the children will ask, “Why these stones?” And then they tell the stories. So we will remember. So we will never forget. So we will become a part of the story. What are your memory stones? What markers do you place that invite persons into your story? Because our faith story begins in our memory. We remember our Baptism. We celebrate Holy Communion in remembrance. The hymns and songs we sing and the scriptures we read and the rituals we follow call us to remember. We look down our pews and remember those who were once there that had such an impact on our life. We come to the altar and recall our own moment of salvation. We place our memory stones to recall those important moments in our life and faith, and by doing so invite others into our story. Remembering in 3D. Our memories form us and transform us. So on this Memorial Day, let us truly remember God in 3d. What He has done, is doing, and will do. Let us place our memory stones where they will remain forever and invite persons into the story of our faith. Let us become the story tellers so that those who hear will walk away from this place transformed – proclaiming that today they are truly a Disciple of Christ. Many of us remember the terrible civil war in Bosnia in the 1990’s and the terrible siege of the capital city of Sarajevo, triggering a humanitarian crisis of epic proportions. On February 5, 1994 the main market in Sarajevo was crowded with hundreds of people just trying to get a share of the meager commodities that had been airlifted into the capitol city. And without warning a rocket exploded in the midst of that sea of humanity, instantly killing 68 people and reducing the market to rubble as the stone buildings collapsed. And the fear was that this would be the last straw. That the people would give up all hope and will, and the city would finally fall to the enemy. But a cellist from the Sarajevo Symphony, wanting to keep alive the memory of those 68 people went to the remains of the market the very next day, and carrying a chair and his cello he went into the midst of the fallen stones, and he called out the name of one of those 68 martyrs, and without saying anything else, played a short concert in memory of that victim on his cello. And as he played he transformed the stones all around him into memory stones – so that the people would never forget what had happened there and the lives that were lost. And every day for the next 67 days he returned, carried his chair and cello into the midst of the stones and played a memorial concert for one of those victims. And he always ended the concert with Amazing Grace. Every day he came in memory of the lives that were lost, but more importantly to honor the lives they had lived and in the process transformed that rubble from a symbol of the hatred that had gripped his country into a testimony of love and hope and courage. As you came in this morning you have were given a memory stone. Where are the places of transformation for you? Where would you like to place your memory stone today, recalling that transforming moment in your life and inviting others to share in your story? Perhaps it was in the waters of Baptism. Or in celebrating the Lord’s supper? Or perhaps it was kneeling at an altar and inviting Jesus into your life? Or maybe in a Sunday School class? Or maybe there was a special person who by drawing you into their story, changed your life forever? Where was that place where you crossed over and your life was transformed forever? When you entered into the promised land. As we close today, let me call us into a time of remembering. Feel free to get up out of your pew and place your memory stone at that place of transformation. You might even need to leave the Sanctuary and go to a class room or the chapel – and remember your place of crossing over. We’ll wait. Or maybe you just want to bring them to this altar and place them here as a testament to God being with you in the past and today and forever. So that when people ask “Why these stones?” You can incorporate them into your memories, your story of God.